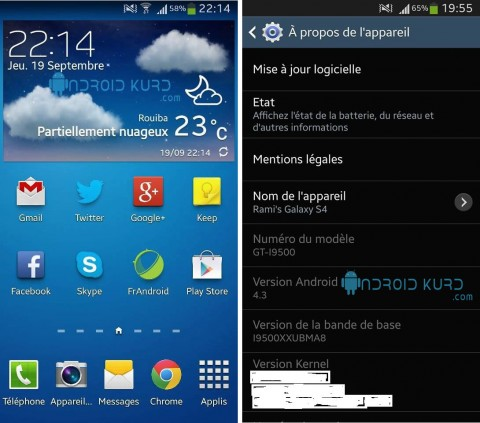 Following the appearance of a Galaxy S3 running on Android 4.3 (which is most likely a fake), a screenshot showing the new version of Android running on an octa-core Galaxy S4 has surfaced online. The firmware version is XXUBMA8, one that we haven’t seen before (though it’s quite similar to XXUBMF8), but that’s about all the information that can be gleaned from the screenshot. The Android 4.3 update is expected to add a couple of features from the Galaxy Note 3, in addition to standard 4.3 features such as improved performance and security, OpenGL 3.0 support, always-on Wi-Fi scanning for location reporting, and more. Samsung has promised to release the update in October, so it won’t be long before we find out what Android 4.3 brings to millions of Galaxy S4 owners.